Last week, I mentioned how Russ from work keeps criticizing me for seemingly rating every sandwich in the 80s or above. I gave Russ a piece of my mind on Thursday, because, as a spreadsheet jockey, he should understand selection bias. Now that I’m only discussing one sandwich a week, I’m not reviewing every sandwich I eat in a week. So it’s a pretty safe bet I’m writing about the most notable sandwich I ate in the week, which usually means the best sandwich. Are you coming here to read about the crappy knockoff sandwiches I get from the soulless Midtown food bar places around my office? I certainly hope not, because I’m not writing about them. So here’s another excellent sandwich, the best I ate this week. Bite me, Russ. The sandwich: Bacon and Cheddar Burger, Bill’s Bar and Burger, two locations in Manhattan, one that happens to be directly across the street from my office. The construction: What it sounds like: A burger with bacon and cheddar cheese on a sesame-seed bun. I added ketchup from the table, as seen in the photo below, but once I dipped my fry in the little accompanying cup of ketchup, I realized my mistake. The fries at Bill’s Bar and Burger apparently come with the very hot sauce/ketchup hybrid I speculated about last week, which presumably would have been great on the burger. They were excellent and so was the condiment, but this isn’t French Fry of the Week so let’s move on. Important background information: I have been eagerly awaiting the opening of Bill’s Bar and Burger for months. As I’ve discussed, Midtown is something of a wasteland for good, economical eating, though if you use the Internet and your legs you can get by pretty well. Still, Bill’s is right across the street and promised to be a welcome alternative to Heartland Brewery for the occasional midday pow-wow. Sorry, bad review. I’m sorry, but if you ever lose faith in burgers I just do not trust you to review food. I mean, have you even been to a Five Guys, bro? How could you lose faith in burgers? How it tastes: Great. 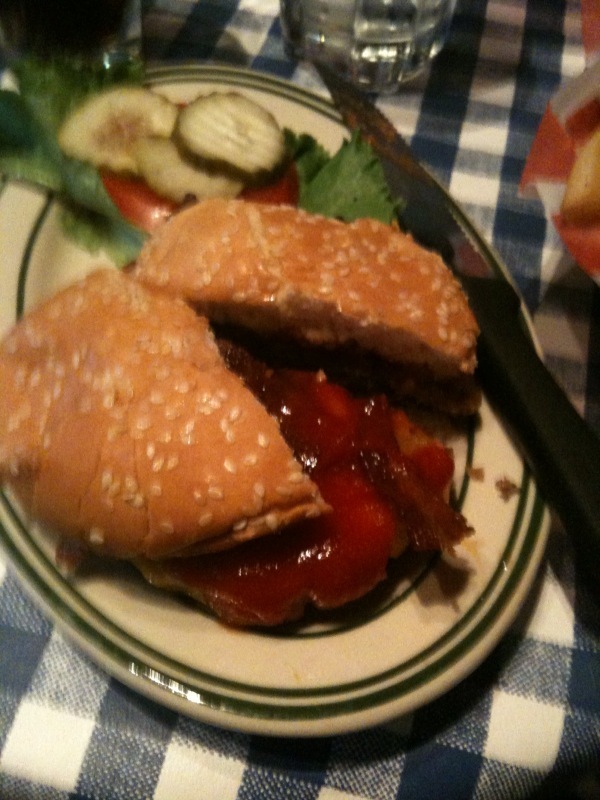 Like I said, I had high hopes for this burger, and it at least met my expectations. I think one thing people miss a lot when making burgers at home is that you want meat with a high fat content. Big-time rookie mistake. Back in college, I used to buy ground beef that was like 93-percent lean, thinking that was the way to get high-quality, meaty tasting burgers. Silly college-aged me didn’t realize that higher fat content makes the burgers juicy and delicious, which is probably why silly college-aged me wound up spending way more time driving 15 miles into Virginia to one of the original Five Guys than barbecuing on our back porch. Judging by all the meatjuice pouring out of every bite of Bill’s burger, I’d guess this thing had to be at least in the 20-percent fat range, right in the optimal zone there. Delicious, flavorful meat. Quality stuff. Also, it had cheese and bacon on it. The bacon, in particular, was notable because Bill’s did it the right way: crispy as all get-out. I don’t need to tell you what good bacon adds to a good burger. I mean I assume I don’t. If you don’t know about that by now, I don’t know what you’re doing reading this blog and not eating a bacon cheeseburger. Alex Belth and I discussed on Friday the way the standards for burgers have risen in the last five-to-ten years. I’ll maintain that it’s less about a fleeting trend and more about competition stemming from the Internet exposing hungry people to a better array of options, but it’s a good point either way. The standard (and still tasty, don’t get me wrong) diner cheeseburger now seems only replacement-level. In college we used to drive a 20 minutes to get to Five Guys, back when there were only a couple of them, and now they’re practically ubiquitous (except in Westchester, frustratingly enough). This is a good thing. What it’s worth: Bill’s is a sit-down place, which means you’re going to have to tip your waiter and maybe buy a drink, plus the burgers don’t come with fries so if you’re looking to get starchy with it it’ll be an extra four bucks. But the bacon and cheddar burger only costs $7.50, which is a pretty good deal for Midtown. It’s not a particularly huge burger, but that’s probably a good thing if you’re eating in the middle of your workday because then you’re not asleep at your desk by 3 p.m.
How it rates: I want to reserve the right to hold off on rating Bill’s bacon and cheddar burger for a couple of reasons. For one, burgers are something I take very seriously, perhaps moreso than any other sandwich. And after one sampling, I sense Bill’s might be an upper-echelon burger, but I don’t want to overrate it based on only one experience. Second, I defy Russ from work — who will sometimes go weeks eating the same sandwich every day — to eat this or any other burger from Bill’s and tell me it doesn’t deserve at least an 85. It’s right across the street, Russ. Your right about midtown. I worked there for a few years and the selections for lunch were basically horrid. Just littered with those corporate pay by the pound food bars or those crappy gourmet deli’s that’s try to hard to be gourmet. Went to Bill’s last week. Will definitely go back and everything was delicious, but I was disappointed in the “Bobcat”. It’s a burger with jack cheese and jalapenos. Was not even slightly hot. Good to know; that was the other burger I considered. The best burger at Bill’s is the simple Sunset and Vine. Despite a complete absence of bacon, it’s the superior selection. I’ve had the mushroom burger too, which was awesome. Great onion rings too, and unlike Five Guys, you can actually order a milk shake.